Last week there was a great deal of coverage by many of the same sites that have no interest in truthfully describing competency-based education, the purpose of student data collection, what Outcomes Based Education is really about, or how learning standards really work hyping Governor DeSantis’ decision to take Florida from the Common Core. I read the articles in between my real life appointments these days and continue to see an alarming pattern of deceit. 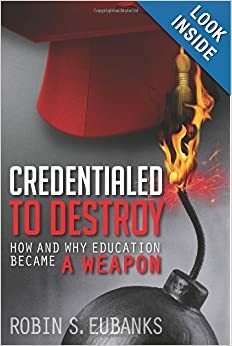 Let’s talk a bit about what the seemingly well-intentioned governor should know apart from his need to quickly read Credentialed to Destroy cover to cover. First, if the new goals for what the students in Florida are to Know and be Able to Do are still aligned to CEDS–the Common Education Data Standards, then Florida remains tied to the Common Core. It simply misunderstands its true nature. So so-called Type 1 direct instruction can be used to instill what John Hattie called ‘visible learning’ that is designed to implement this Vygotskyian approach to get at the desired Constructs, Principles, and Concepts that guide a student’s thinking going forward. I bolded a few terms in that quote so we could specifically address them so we can each avoid this desired individual, ‘personalized’, fire that is to promote collective transformation at an internal, neurological level. Did you know that back in April 2018 the Council of Europe formally adopted “Competences for Democratic Culture: living together as equals in culturally diverse democratic societies.” It created a CDC framework on “how we nurture a set of common values around which to organise,’ which could usefully be nicknamed a ‘common core’. The framework creates 3 sets of values, 6 attitudes, 8 skills, and 3 bodies of knowledge and critical understanding that all students must now be able to demonstrate. So if what Florida implements instead fits with what that CDC Framework lays out as its concept of ‘competence’, then Florida still has a common core and it’s a global, transformative template. Pretty sure that active and adaptive manner for a given social context in that last sentence is what we in the West now call a Growth Mindset, which makes sense since Carol Dweck was a Vygotsky scholar before she came up with that particular euphonious euphemism for his Soviet theories. Anyway, we need Governor DeSantis and his advisors to appreciate something else I picked up from a 2017 presentation on the CDC Framework in Moscow, Russia where the slide laid out what it called Descriptors that ties in with what I know about how the referenced CEDS mentioned above or UNESCO’s standards actually work globally. There are Sets of Descriptors for each competence specified by the model. “A descriptor is a statement or description of what a person is able to do if they have mastered a particular competence, These descriptors have been formulated using the language of learning outcomes, and they were validated through a survey that involved over 1,200 teachers who were drawn from across Europe.” The slide goes on to note that there are Descriptors for the various levels of education (e.g.- preschool, primary, secondary, higher) and to proficiency levels (e.g.- basic, intermediate, advanced). Is Yuval Levin’s vision one of those Governor DeSantis is listening to in promoting his civic instruction for Florida schools? If so, we still have a common core being instilled of the same kind Vygotsky had in mind years ago and what the CDC framework promotes now. The Governor also made a statement about moving away from ‘standardized assessments,’ which suggested to me someone is shifting him towards the Learner-centered, Transformative-based, Context-oriented vision laid out last week here https://education-reimagined.org/how-to-shift-from-education-as-content-to-education-as-context/ that fits with all the quotes I have used in this post so far. That author from Iowa BIG uses the term Universal Constructs to mean what is laid out in the CDC Framework. If someone is providing and reenforcing something akin to these Universal Constructs tied to something like CEDS and its Descriptors, then we still have a common core, instilled character and citizenship, vision. Reading, math, and science are no longer valued as a body of knowledge useful for its own sake and an individual’s own purposes. Let me close with a quote to illustrate the difference and hope that February will not throw up as many personal roadblocks to my writing as January did. Those students have an instilled common core at the level of their mind and personality designed so that they act and are motivated to act in a certain way that is designed to ultimately transform how both American society and the world function in the future. It could not be more centrally planned, but because the planned implementation is local and neurological, it can be hard to see. All the deceit surrounding the Common Core simply made that harder. But as my writing continues to demonstrate, difficult does not mean impossible once we discern the true actual template and need for a common core. It’s essential to all these plans for transformative change without effective opposition. And there is nothing Conservative about deceit to effect intentional social, political, and economic transformations using education. It reminds me of something one of the Integral Theorists wrote where he said the admitted Progressives could focus on transforming the external, material world, while declared ‘Conservatives’ could maneuver to transform the internal rudders guiding personal behavior. That really does describe what is going on and why I see such a Convergence behind the scenes. Let’s talk about that next. Epiphany has long been one of my favorite words because it captures that moment of mental illumination when everything suddenly clicks into place in terms of connections. The sudden manifestation of the meaning of something though is a private affair and the connections I see, while real, may be inconvenient to those hoping for “shared meaning” as so many classroom mandates now require. It is also inherently “old brain thinking” instead of the desired “new brain thinking” that will be widely shared and politically approved. Even though most people are unaware of how learning standards like the Common Core or a Competency Framework really work, we are going back in time to a world where religious bodies and political authorities literally had an ability to rule “the activities and beliefs of its citizens.” That real effect gets hidden by what K-12 schools pretend they are really pushing. Meanwhile, school administrators, especially district supers, lie to parents and the public about it. Since “New Brain Thinking ” is the true aim, let’s look into what is being eliminated. “Old brain thinking is characterized by the limited capacity to contemplate only those innovations that might logically evolve out of the current system. The old brain seems incapable of considering a radical change in the system itself–that is, the possibility of operating under a different set of rules.” No one is going to talk that explicitly in public of course. I only found that quote following the thread of Fostering Communities of Learners in schools to its US beginning, a book called The Different Drum: Community Making and Peace. Parents, of course, would become rightfully alarmed if they traced the required obligations of collaboration and shared meaning back to a forthright statement of a required “psychological death” of their child. See why there is such a fondness for euphemisms? Sometimes when I write I do mull over what would be a catchy metaphor to illustrate my point, but that is not where the phrase Cannibals of the Mind came from. Remember the famous phrase about being able to see the soul of certain people through the anger, joy, or flashes of brilliance firing through their eyes? Last week three different area School District Supers appeared on local TV. The first two, from the City of Atlanta, famous for its cheating scandal, and Fulton County, proud to be a national exemplar of competency-based learning, were in a local court fighting to be able to begin collecting property taxes, however confused or in error, the underlying tax digest was. They were very angry, not about the children, but about the ability to pay their loyal apparatchiks pushing these lied about visions. If that seems cruel, so is area supers insisting they will use Kurt Lewin (by name)’s famous Freeze, Unfreeze, Refreeze social psych techniques on any teacher wanting to continue to make the transmission of a body of knowledge the point of school. Suddenly seeing the highly emotional anger in those eyes and hearing about their loyalist employees “right to be paid” and knowing what is actually being pushed and what it really intends to do, that phrase “Cannibals of the Mind” just came to me. Boy, does it fit. The other Super on area TV had issued a district ruling that none of the sports coaches in the districts could participate in any player-initiated prayers. I don’t think that is a valid interpretation of what Con Law requires, but what I noticed in this super’s eyes was not anger. Instead, he talked and his eyes simply looked vacant as if there was no synaptic firing. Given what these Supers and their admins want to be paid and how they typically move from district to district pushing neural rewiring for ever increasing amounts of money (hence my phrase Gypsy Supers) as well as my personal experiences with what drives them, I think we have Greed, Chips on the Shoulder, and Downright Ignorance driving these Cannibals of the Mind. Since they will not truthfully tell us what they are doing, let’s dig into what is really being put in place and why. Otherwise, we are about to get a society inhabited by highly emotional people whose “New Brain Thinking” is not thinking in the traditional sense at all. Scott Peck admitted in his book calling for “New Brain Thinking” and required practices that now “our individualism must be counterbalanced by commitment”. He was writing in the 80s when nuclear war with the USSR was still a real threat, but his required practices that would be “the only way that human evolution will be able to proceed” survived the USSR and the Fall of the Berlin Wall. Now they are inserted in learning standards or characteristics of each Learner or future Graduate. Peck knew, and now educators globally are using, the fact that “the most salient feature of human nature lies in its capacity to be molded by culture and experience.” This is what the Cannibals of the Mind and their Loyalists rely on to drive another revolution 100 Years after Lenin and the Bolsheviks commenced the last one on November 7, 1917. They are using psychological techniques and learning theories that were initially hatched in the USSR and this time they hope the revolution will take. This time the revolution is at the neural level of the mind and personality with educators relying on what Peck called the “capacity for transformation. It is the capacity for transformation that is the most essential characteristic of human nature. And again paradoxically, this capacity is both the basic cause of war and the basic cure for war.” As I have noted, this real target and the reason for targeting it and methods used are all the source of a great deal of organized deceit. Teachers aren’t assigned Peck’s book and any references to the Soviet psych origins of classroom mandates are usually in a footnote. Fortunately, I have typically read the books being footnoted and can recognize the same or equivalent theories even when there are no footnotes at all. It also makes fully controlled inner speech, especially as teachers are advised to help students learn the vocabulary of the desired emotions they are to develop through school. The author wants “self reflection to guide their lives, supporting their growth toward positive goals.” Essentially education decides what goals and characteristics it wants students to internalize and then activities and experiences are developed until these traits become internalized Habits of Mind, neurally instilled. And lied about constantly. Does Cannibals of the Mind still seem harsh? These kind of aspirations should not be implemented in the proverbial dark of night by Cannibals of the Mind overpaid to direct activities to rewire our children’s brains. These go to some of the most fundamental questions any civilization ever addresses. See how dangerous it is to put school board members through psychological team training of the type Peck advocated so they will come to believe that what the Supers tell them is true? They also seem to be trained to believe that no one without an education degree is allowed to know comment on what educators can do in the classroom. How convenient for the Cannibals of the Mind and the politicians, institutions, and theories they are installing and reenforcing. No scrutiny, no effective protest. No recognition that this was how dire times began in the past.